#KUfball wins the coin toss and defers. Rutgers will receive opening kickoff. Blackshear trips up in backfield on 2nd down. On 3rd & long #KUfball calls timeout. Tovi starting at C again for #KUfball . Same starting O-line as last week at CMU. 6-play drive for 41 yards. Azur Kamara had a potential pick-6 hit him in the hands. 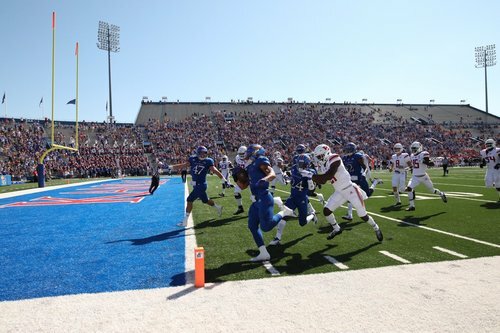 #KUfball off to hot start vs Rutgers. Up 9-0, Rui point after attempt to come. 39-yard INT return for a TD by Torneden on Rutgers' second possession. Less than 5 minutes in #KUfball up 10-0. RU struggling big-time early. Fumble forced by Shak Taylor, recovered by Joe Dineen. #KUfball offense opens at 22 yard line. Rui's FG try is blocked and Rutgers houses it. Roberts scooped it and ran for a TD. Pooka Williams back to return kickoff with Ryan Schadler. How does a man Pooka Wiliams' size so easily break tackles? What a swing! Open man in the endzone for Bender could have put us up 17-0. Instead it's 10-7. Take 7 off and give it to the other guys. 14-point swing. Miles Kendrick with a carry to right side where he couldn't turn the corner followed by an incompletion. That is KU football, right there. How is it that Pooka got no touches or targets in that series? Rutgers continues giving the football away. Willie McCaleb emerges from scrum with the ball. Kendrick back in for this series. Fires deep, far too deep, on 1st down. #KUfball Incomplete.